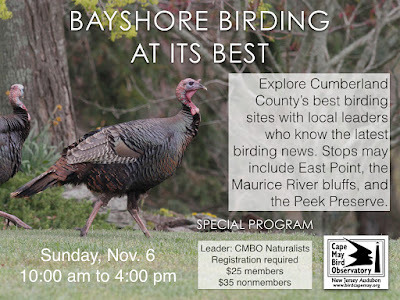 search for an array of ducks, raptors, and much more could include any or all of the following hotspots: East Point for migrant raptors and other birds; the “Bluffs” on the Maurice River; the Natural Lands Trust’s Peek Preserve and other little-known spots in Cumberland County. Meets at the Mauricetown WaWa on Rt. 47. 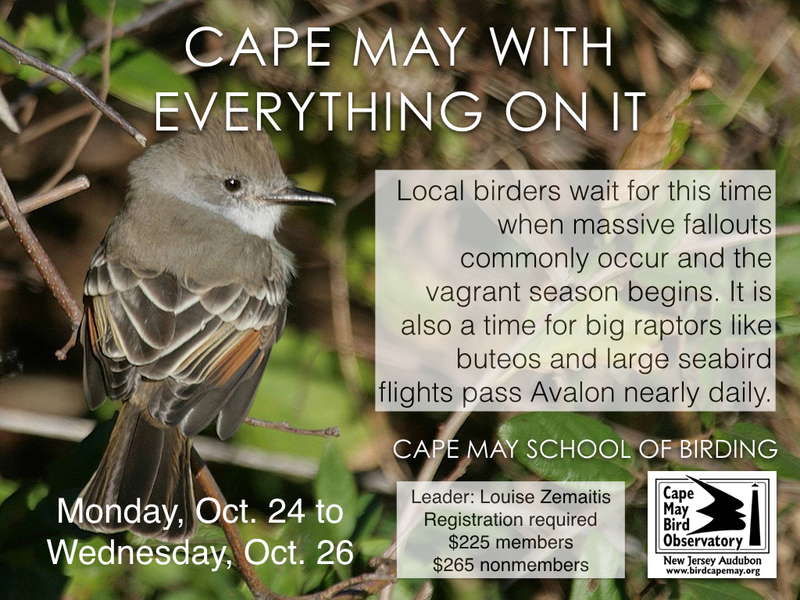 Call 609-400-3864 today to register, or email the Program Registrar at cmboregistrar@njaudubon.org with your name, address and phone number. She'll call back to complete your registration. 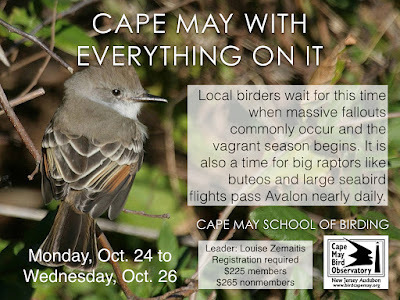 If you are going to be in town for our Fall Festival, why not extend your stay and join Louise Zemaitis for a three-day birding adventure. Long-range forecasts are promising for a cold front bringing on a Cape May classic, possibly even a fallout! Call 609-400-3864 today to register, or email the Program Registrar at cmboregistrar@njaudubon.org with your name, address and phone number. If you enjoy reading this blog, please support it by becoming a CMBO member. Click here to join online today! Follow us on Twitter for the latest CMBO News and Sightings! Report sightings to Brett Ewald, Program Director. © 2007 - 2018 New Jersey Audubon / Cape May Bird Observatory, all rights reserved. Powered by Blogger.